My favorite ghost story as a kid. I still remember the profound frustration of not knowing exactly what happened to Ichabod Crane. Questions abounded. 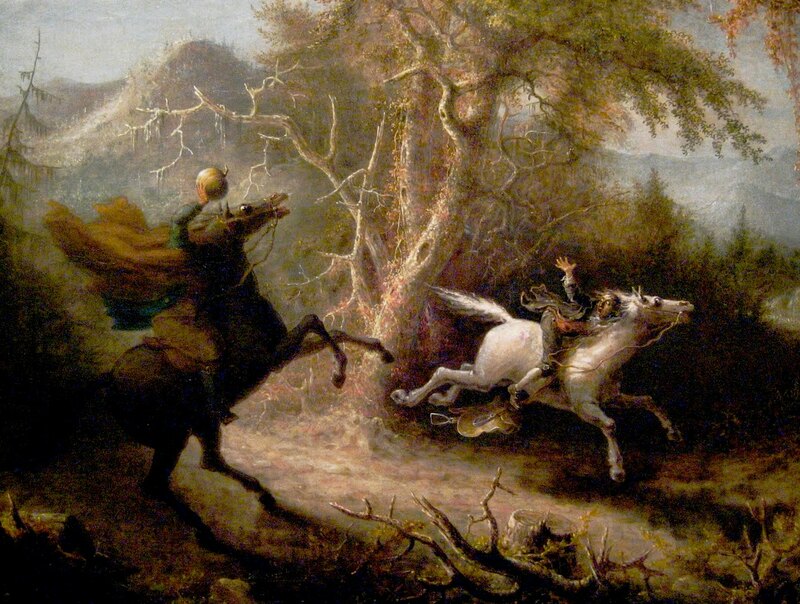 As it turns out, looking a bit into the history of “Sleepy Hollow,” there are just as many questions about the origins of the story itself. 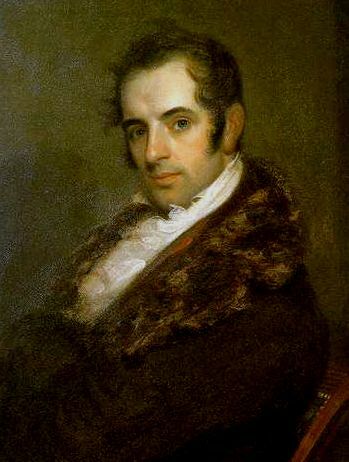 Washington Irving (1783-1859) published “The Legend of Sleepy Hollow” in 1819 as part of a collection of stories titled The Sketch Book of Geoffrey Crayon. Also included was the classic “Rip Van Winkle.” The stories propelled him to fame. He is often lauded as the first great American writer and his tales the first great works inspired by uniquely American folklore. Americans were suffering from a cultural inferiority complex at the time and Irving gave them a sense of a national mythology that was just their own. He painted a picture of a haunting and magical Hudson River Valley, rich with the folklore of the descendants of Dutch settlers. He claimed that he learned this folklore as a teenager. In 1793, during an outbreak of yellow fever, he was sent by his parents from his home in Manhattan to stay with friends up river in Tarrytown. Over the next several years he would visit other locations in the Hudson River Valley and purportedly heard many an old Dutch legend which influenced his writing. The origins of the “The Legend of Sleepy Hollow” are debated, hotly at times, by scholars and journalists. Were the characters based on actual people? If the story was based on old folklore, as the author suggested, where did he hear these stories? And where was Sleepy Hollow? I have, while on my way to the Tappan Zee Bridge, many times seen the exit signs for Sleepy Hollow and assumed that it was a historical place, so named since Irving’s time. Not so. This notion has been contested and many, including President Martin Van Buren, have claimed that Irving based his story on Kinderhook, New York, the president’s birthplace. Irving had spent a few weeks in Kinderhook in 1809 and apparently based several key characters after actual people there. In an effort, perhaps, to settle the matter once and for all, in 1996 the village of North Tarrytown renamed itself Sleepy Hollow. I doubt that pleased the Kinderhook camp. Another of the questions surrounding the story is the identity of the famous Ichabod Crane. Fictitious, or inspired by a historical figure? There was, in fact, an actual Ichabod Crane. A career soldier born in Elizabeth, New Jersey in 1787, Crane served as a Marine and later a U.S. Army officer. During the War of 1812, he was stationed on the Canadian front at Fort Pike in Sackett’s Harbor, New York. Irving served for a time as an aide-de-camp to Governor Daniel Tompkins who played an active role in organizing New York’s defenses. While at Fort Pike in 1814, Irving met Major Crane. That name, Ichabod Crane…that splendid name, just the sound of it evoking images of a gangly Yankee schoolmaster, apparently stuck in Irving’s mind. The soldier was nothing like the character, but the name would be stolen nonetheless. After the story was published, Major Crane apparently resented being associated with such a laughable character, even if only by name. The character of Ichabod Crane was, according to some, inspired by an actual Yankee schoolmaster whom Irving befriended when he stayed in Kinderhook. Jesse Merwin, originally from Connecticut, had settled in Kinderhook and taught school there. After the story was published, Merwin produced correspondence from Irving proving that the two knew each other. Unlike Major Crane, schoolmaster Merwin seems to have been proud of his association with the story. And what of the Headless Horseman himself? In the story, he is the ghost of a Hessian soldier from the Revolutionary War, beheaded by a cannonball in some unnamed battle, who travels nightly in search of his head. Some have argued that this was a local tale told to Irving when he lived along the Hudson, and old bit of folklore that actually preceded the Revolution passed down by the descendants of Dutch settlers. Others have pointed to older European traditions, arguing that Irving was inspired by legends of the “Wild Huntsman,” a ghostly rider who terrified nighttime travelers with his pack of hounds in Medieval Germany. Irving did indeed visit Germany and learned a great deal of its folklore, but not until after he wrote “Sleepy Hollow.” So, exactly how and where Irving got the idea for his Headless Horseman is unclear. But he was definitely not the first to, at least verbally, tell the tale of a headless, ghostly rider. An aspect of the back-story that I find most intriguing was highlighted by Judith Richardson in her recent book Possessions: The History and Uses of Haunting in the Hudson Valley. In 1815, while in a tough financial spot, Irving went to England (as many American writers of that era did) to learn from the established literary circles there and perhaps get a much-needed boost to his career. He would remain in England for many years. It was in Birmingham that he wrote “Rip Van Winkle” in 1817 and “Sleepy Hollow” in 1819. Ironically, it was probably not his youthful years among the rural descendants of Dutch settlers in the Hudson River Valley that so shaped his writing, but the romanticism of English writers such as Samuel Coleridge and Walter Scott. Scott was a particularly prominent figure in Irving’s life, becoming a mentor to him and a life-long friend. Thus, it seems that Irving was not so much influenced by the rich folklore of the Hudson River Valley as the other way around. Inspired by the writings of English and Scottish romantics, Irving infused his native region with ghosts, sprites and spirits…all transplanted, as it were, from the Scottish Highlands by the author.